The next-generation iPhones are almost here, and when Apple takes the stage on Tuesday to show them off to the world, you better have a plan. I’m not talking about a sneaky blueprint for snagging the first spot in line on iPhone launch day, I’m talking about how to get the most cash when confronting all the tricky buyback, trade-in or sell-on-the street options. I searched high and low for the best prices on iPhone trade-ins, comparing the likes of eBay, Amazon, Gazelle, Swappa, NextWorth and even Apple itself, and I’ve got my plan in place (spoiler alert: it’s eBay). So buckle up as I run down your options and next steps so you can snag a shiny new smartphone with the smallest dent to your bank account possible. 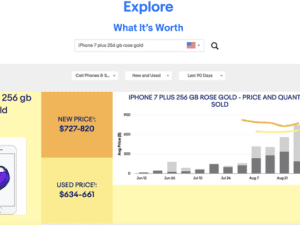 You can easily get the most money for a previous generation iPhone by selling it on eBay. It’s the best place to turn your iPhone into cash because you’re selling directly to a buyer, and with eBay’s price guarantee, you can lock in the trending sale price of your phone when you put up your listing. If it ends up selling for less, eBay makes up the difference and gives you a $20 coupon for your trouble. 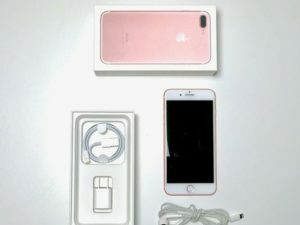 *Based on iPhone 7 Plus, in “like new” condition, rose gold, 256GB on At&T. Note: price quotes fluctuate depending on dates. Pricing has been updated on Sept. 11. eBay prices don’t include shipping, handling and PayPal fees. Start with eBay’s “What It’s Worth” tool. Just type in your phone model, color, and storage size and it tells you a current trending range for a selling price for your phone. Mine was $694-$832. If this looks good, head straight to Sell It Yourself, click “Create a Listing,” and follow the prompts: Brand, Model, Carrier, Capacity, Color, Condition. When I ran this search, eBay said I could count on at least $740.79 for my 256GB iPhone 7 Plus (AT&T), in great condition, which is a mile higher than any other option. So what now? Shine up my smartphone with a microfiber cloth, pull the box down from the shelf I stored it on, and corral the charging cable, earbuds, and USB adapter. Those accessories are a big part of the “like new” selling price, so don’t leave them out. Then, a quick photo of all the items, laid out neatly on a clean table with bright lighting, and I’m basically done — since eBay populates the listing with all the important information. When the sale’s over, the phone and all its doodads go into a (free) USPS shipping box, I print the label off of PayPal, sit back and count my dollars. EBay is far and away my top pick for big bucks, though there is one caveat: The money you get back will be a bit less than the price guarantee to factor in shipping, handling and PayPal fees. There are other options as well. Gazelle, Nextworth, Best Buy and Apple, are all about the same in terms of how they work, but the prices can vary drastically. 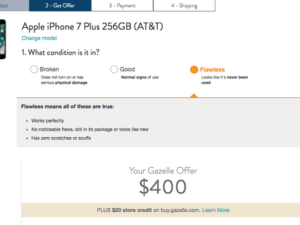 While all of these numbers are subject to fluctuate as we get closer to the sale of the new phones, as about a week before the Sept 12. press event, Gazelle wanted to give me $400 for my iPhone 7 Plus, and NextWorth was offering $350. That’s a lot less than eBay’s guarantee, but both these companies send a prepaid shipping box and all I have to do is toss the phone in and collect my cash, no waiting or listing required. Apple, on the other hand, wants to hook me up with $425 (yay!) but that’s only in Apple Store credit (boo!). Best Buy has a similar deal, with a $385 offer payable on an e-gift card. Meh. Amazon brings up the rear on iPhone trade-ins. After combing through the huge list of trade-in offers for my phone (only a few actually matched my phone model, color, and carrier) none of the matching offers came within $20 of even the lowest price elsewhere. Pass. Then there’s Swappa, which is a bit of a wildcard. It’s a bit like eBay in that you’ll be selling the phone yourself, but there’s really no guarantee that your phone will sell for a price that you’re happy with. 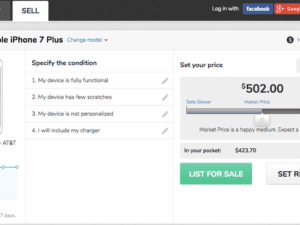 When I ran the search, Swappa’s pricing graphs say I should expect around $550 for my iPhone, but that’s hardly a promise. One big advantage of Swappa is that the site’s sales fee is oftentimes lower than eBay. But, it’s a gamble. One last thing to consider is when you’ll actually have to part with your current iPhone. If you list your phone on eBay or Swappa, buyers are going to expect you to send it ASAP. If that doesn’t fit with your plans to buy the next iPhone (which won’t actually hit stores until later in September, or even longer…) getting a price locked in with Gazelle or NextWorth might be your best bet, despite it not being as high. Remember, before you ship your iPhone off to live its second life you need to back it all up, especially your photos, music, and contacts, then wipe it clean of all your precious data. Head into the Settings menu and sign out of your Apple accounts (scroll down to the bottom of the Apple ID page). Then, go to General > Reset and tap “Erase All Content And Settings” to bring it back to factory new.